Beside a blank canvas, a trio of fanciful female figures visits a dozing painter. One figure places a consoling arm around the artist and appears about to whisper words of inspiration in his ear. Another figure, upright at the right edge of the sheet, moves toward the artist with a palm frond in her left hand. An ethereal, winged figure floats through the background. 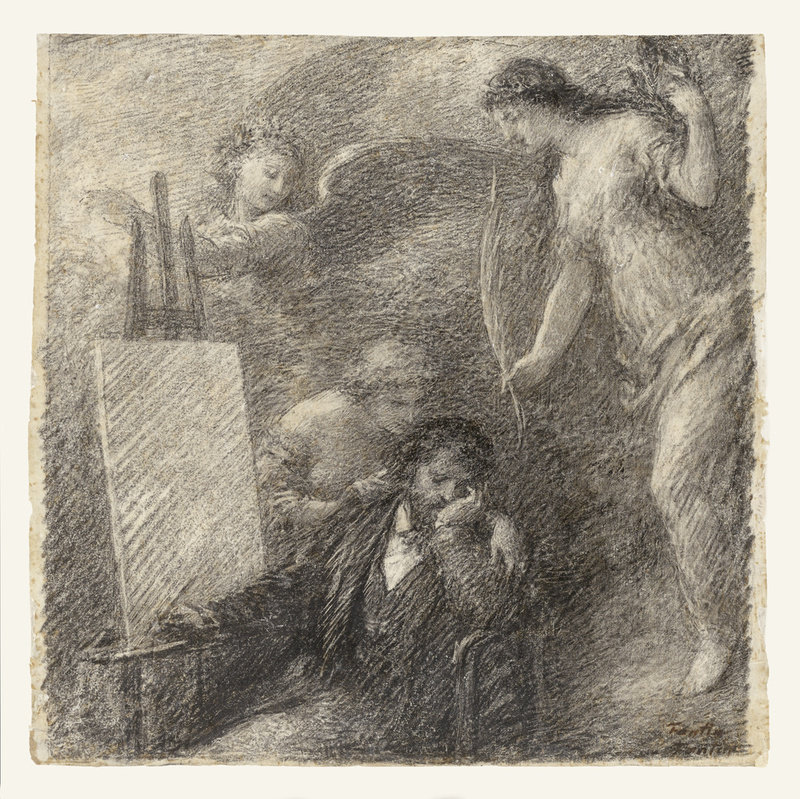 In the lower right corner, Henri Fantin-Latour's signature suggests that the drawing was conceived as an independent work of art. Fantin-Latour was fascinated with the world of the artist and produced both lifelike portraits of his Impressionist contemporaries and imaginative works exploring themes of creativity, inspiration, and vision. The three female visitors in this drawing may represent the sleeping artist's inner life and symbolize his frustrated search for inspiration. Fantin-Latour used the lithographic crayon to enhance this dream-like quality, shrouding the scene in mystery. The artist also scraped away areas of crayon shading to heighten the otherworldly mood.